this is a blog called geometricsleep. : Atacoma who? Totally dying over the insane heel on these Acne boots. They are really killing it with their shoes this season. Now, who has a discount that they can pass along to me? I think I NEED these! ah these are so wonderful, though i am still lusting over the atacoma and trying to decide if i should get them or not before i become a poor grad student. I totally see what you mean about acne killing the shoes this season. I love the horseshoe silhoutte they are using and these are fantastic! I need those!!!! Ahhh Acne breaks my heart, in the best of ways. they're impeccable. that heel is beyond awesome. seriously, acne's shoes this season are IT. love them all. Acne has been releasing awesome shoes over and over. But they're so expensive! 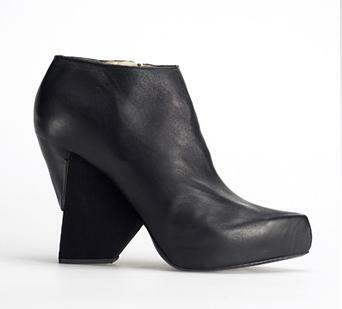 acne's stepping it up, love the heel! trekking to check these out tmrw! Wow those heels are amazing. I am also loving the Acne armoured jeans right now. I need a pair!